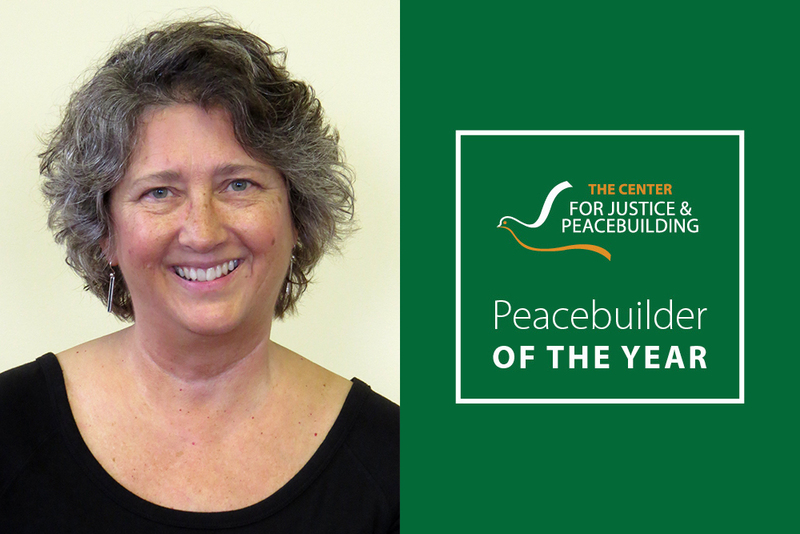 Annette Lantz-Simmons has been named 2018 Peacebuilder of the Year by the Center for Justice and Peacebuilding at Eastern Mennonite University. The annual award recognizes “alumni who have demonstrated exceptional commitment to its mission of supporting conflict transformation, restorative justice, trauma healing, development, organizational leadership and peacebuilding efforts at all levels of society,” said Daryl Byler, executive director of the Center for Justice and Peacebuilding (CJP). Lantz-Simmons is the executive director of the Center for Conflict Resolution (CCR) in Kansas City, Missouri, and first attended the CJP’s Summer Peacebuilding Institute in 2005. She earned a master’s degree in conflict transformation in 2009. All of the 615 alumni who have earned master’s degrees or graduate certificates in conflict transformation or restorative justice from CJP are eligible for the award. The first was conferred on Ali Gohar MA ’02 in 2015, founder and executive director of Just Peace Initiatives in Pakistan. The 2016 recipient was Tammy Krause, MA ’99, an expert in restorative justice, and in 2017 it went to Jean Claude Nkundwa MA ’14, who works for peace in his native country of Burundi from exile in Rwanda. Read more about the award and past recipients. She has also mentored multiple students and graduates from the CJP and its programs, some of whom are now members of her staff. Lantz-Simmons is overseeing the expansion of her organization’s presence into a growing array of settings, working with other staff members who are also CJP trained. With support from peacebuilding institute participant Jackie Buycks, CCR is providing training and facilitation for the ongoing transition of the Kansas City Public School system toward using discipline techniques rooted in restorative justice. It’s an arm of the nonprofit that is “growing fast,” said Lantz-Simmons, who was featured in a recent KCPT report about the school system’s move to restorative discipline. And through the efforts of Greg Winship, the first graduate of the MA in restorative justice program, restorative justice and conflict resolution training work is extending into prisons. The trainings are not only for prison residents: a minimum security prison is planning to train its staff, too. Eventually, Lantz-Simmons said, the prison will offer the CCR training to both residents and staff – together. It was at a Missouri peace colloquy featuring CJP’s Howard Zehr as keynote speaker that Lantz-Simmons first met CCR founder Diane Kyser, a 2006 CJP graduate. Their “instant and strong connection” was affirmation of Lantz-Simmons’ trajectory toward her current work. The Center for Conflict Resolution is definitely making a difference in the Kansas City Metro area; strongly supported by the mayor and leaders in the law enforcement community, many school systems and the courts. Congratulations to Annette for this well deserved honor! Congratulations Annette! You are so deserving of this wonderful honor and award. You are the best Executive Director I’ve ever worked for! You truly walk the talk of Peacebuilding. I have know Annette for over a year and her compassion for people and passion for working for peace is very commendable. I am honored to be associated with her and her work. Every city in the US needs an Annette Lantz-Simmons and Center for Conflict Resolution. Both are professional, experts, caring, and credible. They are making a difference to today’s society. If they only had a million dollars to be “let loose” on the city and state.